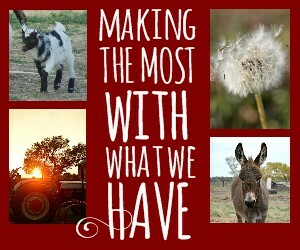 Welcome to our fun little series here on Little House Living, “Making the Most With What We Have”! This series will showcase individuals and families all over the US (and even outside the US!) that are making the most of what they have. We know that you can be a modern homesteader without 160 acres of land and a mule so this series will share the stories of these families so we can get a peek into their lives and learn from each other. We live just outside the city of Charlotte, NC, in a small neighborhood on less than a half acre lot. We spend a lot of our time about 10 minutes away on 4 acres of family land. 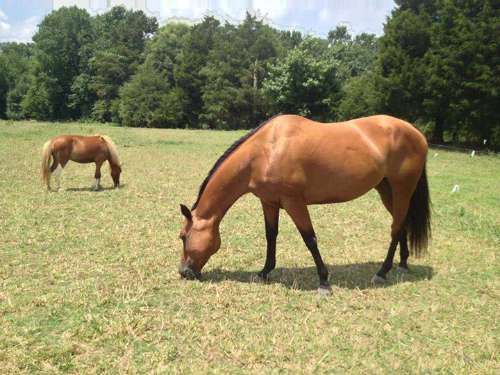 It’s there where we have horses and help with an acre sized garden, it’s our happy place. When we found our home we fell in love with the back yard – large trees, beautiful flowers and a large, covered back porch. Now, it’s become a small glimpse of our dreams. We dream of being in our happy place. We would love to build the home of our dreams on at least 4-5 acres. We want to be able to look out during breakfast and watch the horses graze or sit under the tin roof of the barn during a rainstorm. We want to walk out daily to our garden and collect fresh vegetables for dinner and pick fruit and nuts from the trees for baking some sort of goodies to enjoy and share with friends. In this busy world, we’d love to slow down as much as possible and enjoy everything that God created for us. We want live simply and frugally and most importantly, teach our children to do the same. Our small, fenced backyard can’t hold all of our fruit filled dreams but we do have a small strawberry patch and grow an assortment of herbs that we can pick fresh for meals. We’ve also recently purchased a small greenhouse shelving unit to begin starting our own seeds and keeping herbs for longer growing seasons. To help keep utility costs down, we use a retractable clothes line to dry clothes and recently built a rain barrel for watering plants. We also cut our cable and reduced our data plans on our phones. You’d be surprised what you don’t miss once you give it up. Whenever possible, and when it makes the most sense for our family, we make homemade. Sauces, canned foods, dehydrated foods, baking mixes, cleaning products, things for our animals. You name it and I’m open to trying it. No matter what life throws at us we always trust God to provide and He’s never let us down! We started making the most of what we had when my husband lost his job a few years ago. We had no choice but to cut costs and live simpler. It was without a doubt the best thing that could have ever happened to us. Of course, it was not without it’s challenges but where the Lord has brought us thru that has been nothing short of amazing. Once we learned to live simpler and he got a new job, I quit my job to be a stay at home mom. We voluntarily put ourselves here, in this place where frugal living is a necessity. Where you have no choice but to make the most with what you have, and we love it (most days)! We’re still learning new things daily, some lessons are harder than others, here are some of the most important. Take one step at a time – The ultimate goal lifestyle is so drastically different that you can’t just throw yourselves into it. Start by making a few small changes and gradually adding more so that you don’t become overwhelmed. We started by switching to homemade laundry detergent and cutting our cable off. As we freed up time away from the TV we began cooking more dinners at home, which led to freezer meals. Then we took on gardening, which led to canning and preserving foods. Don’t be afraid of being different – It is different. We learned very quickly that even the closest of friends and family don’t always understand why you desire to do some things differently. Your motives will be questioned and your feelings may get hurt. It’s not a lifestyle that everyone chooses but if it’s one you and your family have chosen be prepared to be misunderstood, at least for a while. Be resourceful – Use the internet, the library, magazines, anything you can get your hands on to research things you’re trying to do. There are lots of great free or low cost resources out there to get you started and help you out along the way. Take a look around and make a list of some things that you spend money on and then research if there are other, cost effective ways. This could include making your own products, diy projects in the yard or garden, even equine massage or dog grooming- two of my newest skills thanks to YouTube! The garden waits for no one – This is something my mom told me the first year I stayed at home. I had things I wanted to do now that I wasn’t chained to a desk all day. There were friends to catch up with and new friends to make- bring on the playdates and lunches. It was great, except, my park play date was scheduled on the same day the green beans were ready to be picked and my lunch was scheduled the day after I picked 50 dozen ears of corn. It rained every other day that week and the green beans grew large and buggy. I ended up picking them off and tossing them just so we’d get some more off the vines and no one has room in their fridge for that much corn. Even with my best efforts in coolers I still lost a large amount of that first harvest. It was a good lesson. Garden season is no longer scheduled with busy days, rather a flexible plan to make sure nothing goes to waste. You work too hard and put too much into it to not make it a priority. When you find a good deal, take advantage of it – We buy in bulk and prepare freezer meals, dehydrate snacks, etc. Just be careful not to buy more than you will actually use. The best deals are still bad ones when you end up wasting or trashing what you’ve purchased. Use what you put away – This sounds so easy but I know I’m not the only one who struggles with it. You put those things in the freezer or pantry to save time and money- don’t be afraid to use them! There is no minimal shelf date. If you put it away this week, it’s ok to use it next week. I have a hard time with that. I’m a food hoarder. I like to store for winter, like winter 2020. I’m getting better. Especially now that I need the freezer space come summer for more veggies. Plan and be organized – don’t go out and buy 10 pounds of markdown chicken if you don’t have a plan to use them or the time to put them away in the freezer. Find a simple meal plan system that works for you to ensure food doesn’t go to waste. Plan your trips into town to be productive and get as many errands run on the same day as possible. Organize your things so they are easy to get to when you need them. The better organized you are, the easier it is, trust me! 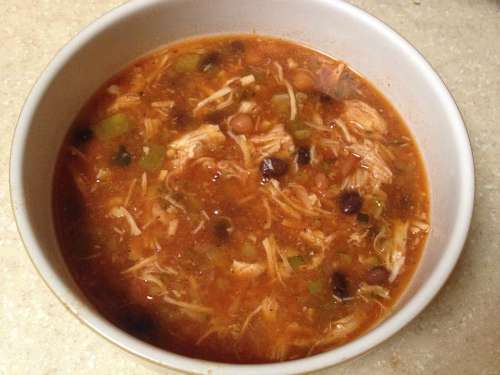 This is a great recipe because it can be put together in the freezer and then thrown in the crock pot to cook on a busy day. Serve it stand alone or add some rice, sour cream or cheese and serve with tortilla chips, etc. It’s also a great way to throw in some veggies for picky eaters. To Assemble to freeze: Add all ingredients to a gallon size Ziploc bag. Freeze flat in freezer. To Serve: Thaw bag completely. Pour in crockpot. Cook on low 6-8 hours. I make lots of these in the summer with fresh zucchini, fresh salsa, fresh corn and even fresh tomato sauce depending on the harvest. If you don’t have enough room to put together a bunch of these in the summer just freeze your shredded zucchini in that portion size so when you are ready to assemble or cook you can add it in with it. You can also use leftover rotisserie or baked chicken from a meal and even homemade chicken stock. My biggest tip would be to let go of any expectations you have of your homesteading journey and instead simply try to do your best. Expectations are often unmet and lead to discontent and comparison. Those things can steal your joy and you should be enjoying your journey! Also, don’t put pressure on yourself. In the beginning I started making everything homemade. Laundry detergent, cleaners, chapstick, deodorant, shampoo. At the time we needed to save money and those were great ways to do so. However, at some point, when the financial stress lifted I just wanted to go and buy some deodorant and some shampoo. Sure homemade was easy and cheap but I just wanted those conveniences. At first I drudgingly continued making my own and then I realized there’s no one making me do those things but myself. There are no homesteading or frugal reward points piling up for doing these things. No one cares if I go back to using store bought deodorant. So why did I? Do what makes the most sense for you and your family at any given time and remember that it’s ok if that changes over time. Don’t get pressured into thinking once you start making something you can’t ever purchase the store-bought version again. My deep freezer. I mentioned that I like to buy in bulk and a nice deep freezer supports that habit. It also helps me have quick, meals available on busy days. Just have fun! The day to day work often requires lots of hard work and sacrifice but at the end of the day it’s still the best kind of day. Thank you Paula for sharing your story with us! 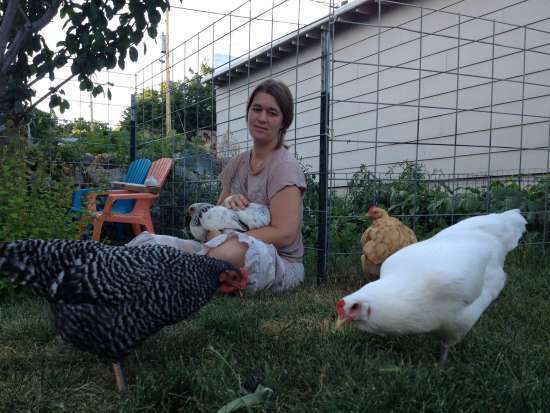 love your thoughts on homesteading! Such great advice. I hope to be able to do this in the future. I really need to find meals to freeze as well since I seem to live off of tv dinners. Thanks Nickie! You might be surprised how easy freezing meals is once you get started! Just start with making extras of some stuff and freezing it. Cooked ground meat is one of the easiest and how we started. Just buy when on sale, cook in bulk and freeze in portions for tacos, spaghetti, salads, chili, etc. Good luck with it! I like that even though you make all your own homemade stuff, you still felt that it was ok to buy some of those products after a while. I, too, have tried making my own dish and laundry detergents, etc. I have found that sometimes using coupons and watching for sales I can sometimes get just as good of a deal on products that may work better. 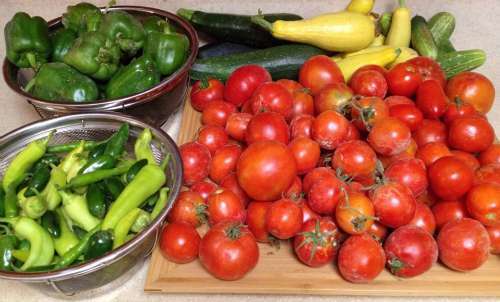 I still love to garden and can my veggies and make freezer meals. But sometimes convenience comes in handy too. It’s all a matter of balance. Thanks Holly! Yes, exactly! It took me far too long to figure out that balance, I put so much pressure on myself in the beginning. Thank you so much for commenting, it’s good to know I’m not alone!